Did you know that a sheep’s normal vision of sight is only seeing six feet? It will eat constantly and will have its head down; all the while it is eating, or looking for food. It moves from one patch of enticing grass to another. It’s like, the sheep is thinking, “oh here’s one, and oh, look, there’s another”. It is not concerned over what the rest of the sheep are doing, or where they are going. It will continue to look for something to eat, wherever it wishes. In short it is wrapped up in its own needs and becomes oblivious to the safety or dangers around it. Now multiply that by a hundred sheep, and you can see that the shepherd must be on his toes, all the time. He is constantly bringing the herd together, ensuring that they will all arrive home safely. No matter how good the shepherd is however, one or two will invariably find a grassy spot behind a knoll, behind a large boulder, or in a stand of trees. And once that happens, the job of the shepherd doubles in its difficulty. He must still continue to keep the herd together, but he must locate all the strays that have wandered from his sight. Why all of this about sheep? Yesterday’s Gospel was from Luke, Chapter 15, verses 1 to 10. 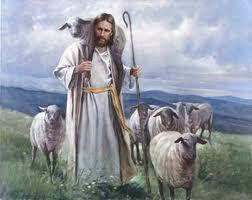 In it is the parable of the Good Shepherd and looking for the one that strayed. The priest mentioned the fact about the sheep’s eyesight. It made an impression on me. I thought about the impact of keeping one’s head down, while coupled with seeing very poorly. We have to agree that this is definitely something that we cannot do in a bustling community with traffic whizzing by. And yet, sometimes we do just that. Whether we call it tunnel vision, or blind spot, one-track mind or being oblivious, the end result is the same…we don’t see, nor do we want to see any other point of view, but our own. We can talk and hear about Christ and His love for us all day. But for it to be meaningful to us, to have this change our ways, we have to put away our blinders. Our blinders are usually set up by ourselves. We have grown comfortable with them. They help us see only as much and as far as we want to see. With them we only see the problems that other people have, the value systems that we know are not right (and are thankful they are not ours). These blinders prevent us from seeing our own, self-made problems, our hampering attitudes, and worst of all, they prevent us from getting closer to Jesus. We are oblivious to the Shepherd hunting us down. We move on from one enticing “grassy” spot to another. We are constantly searching for something that will help us get through our day, something that will satisfy our immediate needs. St. Augustine chose to word it, “Our hearts are restless, until they rest in Thee.” In short, we seek out everything that we know of, that we think will satisfy the aching, yearning in our hearts. All the while the patient Shepherd seeks us out, waiting for that moment when we throw up our hands, and earnestly cry out, “God, help me!” Then, and only then, with our free will desiring assistance, the gentle Shepherd, caresses us and places us on His shoulders and carries us back to the fold.